I'm a mom who works full time during the day, a full time mom in the evenings and weekends, and then after hours do freelance work. I'm exhausted and in need of some TLC, and it's been quite a while since I've been pampered. It would be nice if I found time to go for a manicure and pedicure, but there doesn't seem to be enough hours in each day. Plus, I'd feel guilty spending the money on myself, when I could be saving it for something more important... like my daughters future education. 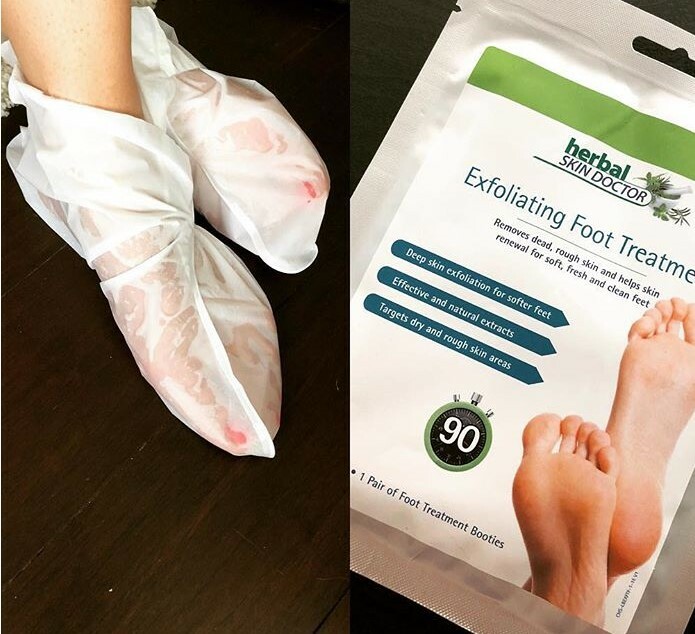 Recently I was contacted by a company that offers beauty products, and I was fortunate to get to test out their Exfoliating Foot Treatment from Herbal Skin Doctor. I was excited to test out the product, and waited until the little Munchkin went down for bed. I opened the package, and fell in love with the smell of the product. I slipped the booties on... they felt cool and relaxing on the feet. I followed the rest of the instructions and sat back with my feet up wearing the booties. Okay, the instructions doesn't say that... but they did mention not to walk around while wearing them. They truly meant it when they wrote that, because if you do... you will most likely rip them. How do I know? The Munchkin woke up, and I had to run after her at one point still wearing them. 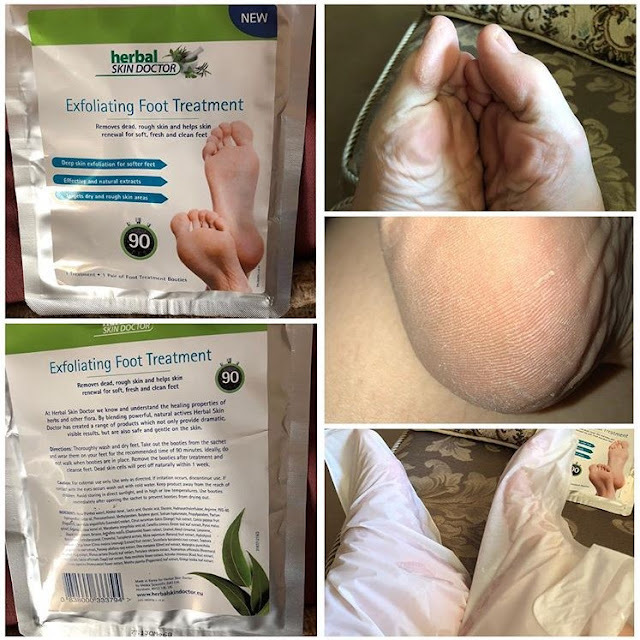 It wasn't exactly a pretty site after, as I ended up having to wrap grocery bags around each foot so that I could finish the last 30 minutes of the treatment. The instructions was to wear them for 90 minutes, and then wash your feet. They weren't magically exfoliated at that time... the magic actually happens within a week later. I noticed about 6 days after the treatment, that my feet felt a little tight and more dry than usual. Within 24 hours they started to peel, and the skin directly under felt amazing. My whole foot didn't peel as I had hoped, but it probably had something to do with the booties ripping before the time finished. Overall, it was an excellent product and a relaxing experience. My feet are feeling normal and not like sandpaper like before. Would I use this product over a pedicure? Hell yes... I don't have the time to go to a spa, nor do I want to spend the extra $! Now if only I could get my daughter to sleep through the night so I could do this again, but this time with a glass of wine.